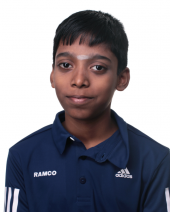 Praggnanandhaa is a International Master from India and will be competing in the U14 section. He is considered to be one of the biggest prodigies of this generation. He won the U-8 World Youth Championship in 2013 and the U-10 World Youth Championship in 2015. Praggnanandhaa made history by becoming the youngest ever IM in history at the age of 10 years, 10 months and 9 days old. His goal is to become the youngest GM in history.